Wither by Lauren DeStefano. Grades 7+ Simon & Schuster, March 2011. 358 pages. Reviewed from ARC provided by publisher. I am not going to lie: it took me a little bit to get into this novel. I kept overthinking the dystopian setting, turning it over and over in my mind to find holes and questions, when what I needed to do was let the words and characters and scenes wash over me. Once I did that, my friends, I could not put this book down! It's a pretty twisted world we find ourselves in. Due to the genetic engineering of a generation of "Super Babies," the descendants of that generation no longer live past age 20 for females and age 25 for males. Plus, due to catastrophic world wars, the continent of North America is the only place in the world that's not a nuclear wasteland. The wealthy amuse themselves with parties, makeup, and virtual reality games. And this is where we find our three sister wives. In that way, the book has the feel of a period novel. Yes, Rhine can go swimming in a pool with virtual reality dolphins, but the majority of her time is spent lounging around with her sister wives, becoming increasingly frustrated with her gilded cage. A big part of the book is the relationships that Rhine develops with her sister wives, stoic Jenna and immature Cecily. In that way, I think this is a book that will appeal to readers of historical fiction. And then there's Gabriel, the servant with oh-so-blue eyes to whom she tells her history and her dreams. It's dangerous to love him, under the watchful eye of her father-in-law, a man bent on discovering an antidote and controlling everything around him. The romance is very nicely developed - subtle, but believable. And the characters are very nicely developed. I especially like what Ms. DeStefano did with Linden because by the end of the book, I was actually rooting for Rhine to stay with him (or, well, part of me was, anyway). I believed in Rhine's struggle with whether she should escape or stay; I was torn right along with her. With its intriguing world and well-developed characters, I think this is a book with wide teen appeal. It's Uglies meets Flowers in the Attic (in a good way). This is the first book in the Chemical Garden trilogy, so I am happy to report that we will hear more from Rhine. And I have to say that I love the cover. I think it evokes the feeling of the book perfectly and there are lots of details from the story included, from the pink eyeshadow to the wedding ring. Debut author Lauren DeStefano is off to a great start with Wither and I can't wait for the next one! Check out more reviews at GreenBean TeenQueen and Presenting Lenore. 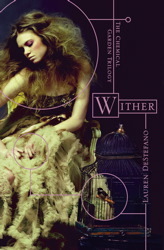 Wither will be on shelves March 22.